The timeless tale continues… The most popular and beloved American historical novel ever written, Gone With the Wind is unparalleled in its portrayal of men and women at once larger than life but as real as ourselves. Now Alexandra Ripley brings us back to Tara and reintroduces us to the characters we remember so well: Rhett, Ashley, Mammy, Suellen, Aunt Pittypat, and, of course, Scarlett. As the classic story, first told over half a century ago, moves forward, the greatest love affair in all fiction is reignited; amidst heartbreak and joy, the endless, consuming passion between Scarlett O’Hara and Rhett Butler reaches its startling culmination. 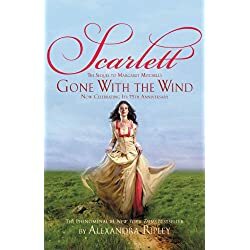 Rich with surprises at every turn and new emotional, breathtaking adventures, Scarlett satisfies our longing to reenter the world of Gone With the Wind. Like its predecessor, Scarlett will find an eternal place in our hearts.